Mediatek Fast Charging Pump Express Explained, Find if Your Phone Have it? MediaTek announced its new fast charging technology last year. Named Pump Express Plus, this new fast charging solution was aimed at reducing charging times. With innovation in the batteries stagnating, fast charging is a good stop-gap solution that most major companies are using. 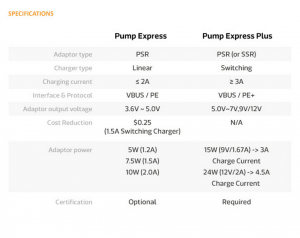 MediaTek’s Pump Express Plus is a response to Qualcomm’s Quick Charge. Both these technologies rely on charging the phones at a higher rate of power initially to give a quick boost to the battery. As the battery nears 80% charge, the rate of power is reduced drastically to make sure it remains stable. In other words, if you start charging your smartphone from 0%, your phone will charge really fast up to 80% if it comes with Qualcomm Quick Charge or Mediatek Pump Express Plus. In comparison, the last 20% charge will take a little longer than usual to charge. It will still be fast, but not as fast as the initial 80%. 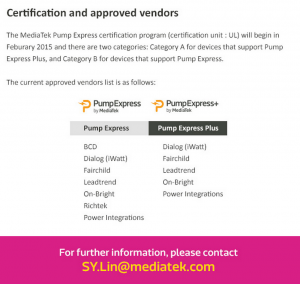 MediaTek Pump Express Plus – How Does It Work? Throughout this introduction to MediaTek Pump Express Plus, you must be wondering just how does this feature work. While I’ve tried to answer your question to a certain extent in the above paragraph, you may be a little confused. I try to make it really simple to understand below, so read on. The idea with Pump Express Plus (and other fast charging mechanisms) is really simple. You need your phones to last longer, but with innovation in the battery technology stagnating, it becomes essential to work around this crucial issue. For this purpose, Mediatek has come up with a solution to charge batteries faster. Pump Express Plus comes in a three-staged profile – Regular, Turbo 1 and Turbo 2. Regular stage charges the phone at the normal current and voltage levels. This stage kicks in at the last 20% levels. The Turbo 1 stage is rated at 11.7W with 1.67A. This is faster than the Regular stage and kicks in just before the Regular stage. The fastest mode is Turbo 2, which charges a compatible phone at 15W at 1.67A. This is faster than the other two stages and kicks in first, if you phone’s battery is very low. Depending on the device and the charger, the charging amperage can go as high as 4.5A, about just 10% less than Qualcomm’s Quick Charge 3.0. 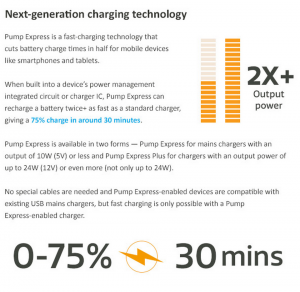 Mediatek claims that Pump Express charges phones nearly twice as faster as a standard charger. According to the company, you can go from 0% to 75% in just 30 minutes with the new Pump Express Plus technology. Is My Device Compatible With Mediatek Pump Express Plus? If you have any doubts or queries, be sure to drop in a comment below and we’ll try to help you. Please Note: Sometimes, even when you phone processor chipset support fast charging, if manufacturer from which smartphone is coming may have not enabled the support for the same. Does my CoolpadNote3 supports it? If yes I have to purchase a new Charger or what? Plz tell me!